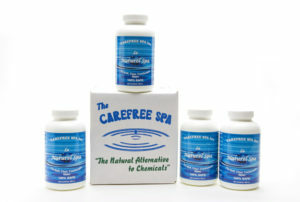 Naturel Spa For a Clean, Clear & Safe Spa with No Toxic Spa Chemicals! When you bought your first spa, you were probably surprised at all the things you had to do just to keep your water looking clean, clear and safe. You probably wondered why it seemed like you needed a chemistry degree just to test the water, adjust the pH, balance the chemicals, dealing with “ring-around-the-hot tub, “shocking” the spa and on and on. Why weren’t you told how much work you’d have to do just to have half-way decent water? …the spa industry does NOT want to talk about. Because if spa owners knew the truth about the toxic chemicals they’ve been sold to keep their spas “safe,” the whole industry would probably collapse. We don’t have many dealers who sell our product in their stores. It’s not because we didn’t try. We approached many dealers when we first started. A few of them told us, quite frankly, they couldn’t make a reasonable profit selling Naturel Spa because it would cannibalize sales of their other more profitable spa chemicals. They want you to buy more chemicals, more often so they can make more money. Good for them, bad for you. It’s bad enough the industry is making a buck at your expense but what’s worse is many of these chemicals like chlorine and bromine are toxic. You’re paying more money to buy chemicals that are not only unhealthful but downright dangerous. Take chlorine for example. Did you know chlorine reacts with organic material in your spa and produces carcinogenic compounds? Many cities are no longer using chlorine to treat their drinking water. And these harsh chemicals are not only hard on you, they’re hard on everything they touch. Your swimsuits fade and wear. Your pumps, heaters and filters require more maintenance and need to be replaced more often. Your spa cover doesn’t last as long as chemical vapors eat away at it constantly. You CAN have a CHEMICAL FREE spa. 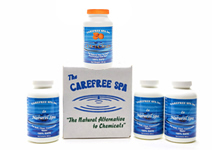 You don’t need a shelf full of expensive, smelly, toxic chemicals to maintain your spa. Naturel Spa is an enzyme-based product with no harsh or toxic chemicals that keeps your spa clear, clean and odorless without testing. And even more amazing, instead of dry skin and irritating rashes caused by chemicals, many users of Naturel Spa report that their skin feels “soft and silky.” In fact, many of them don’t even wash off after they’re through soaking in the spa. They just dry off as if they had just gotten out of a bath tub or stepped out from the shower. Just one bottle of Naturel Spa added to a 500-gallon spa will eliminate foam, odors and cloudiness for up to 40 bather uses which is about two months under normal use. LE NATUREL SPA is made from enzymes, minerals and plant extracts, which provide longevity to the natural enzyme formula. The enzymes used are proprietary and are not available for review. The enzyme formula in Le Naturel Spa has several remarkable properties. It is magnetically charged, which causes the enzymes to quickly attach to contaminants. Once attached, the enzymes increase the molecular activity in the spa, causing the contaminants to biodegrade into simpler compounds, such as carbon dioxide and water. They simply disappear, and the water remains fresh and clear. We’ve made some pretty bold claims that you can replace a shelf full of harsh, toxic chemicals with a single bottle of Naturel Spa. Most people find it hard to believe because the spa industry has convinced them they need to have all these chemicals to maintain their spa. Then when we claim Naturel Spa can also get rid of skin rash (no harsh, toxic chemicals = no rash) AND all they need to do to maintain their spa and keep it safe and clean is add another bottle of Naturel Spa, thought bubbles appear above their heads that say “I don’t believe it. It can’t possibly do ALL that.” We understand. You should be skeptical. We would. We’re so confident you’ll be happy with Naturel Spa that we have a 90-day, 100% Money-back Satisfaction Guarantee. That means if for any reason (or no reason at all), you’re not completely satisfied, we’ll refund every penny of your purchase (minus shipping and handling). No questions asked. No hassles. No forms to fill out. And no hard feelings either. There is no risk to you! Join the thousands of others soaking in the sparkling clean water made possible by Naturel Spa. They’re enjoying their spas and hot tubs instead of maintaining them. They’re feeling safe because they’re no longer exposing themselves to toxic chemicals. And they’re ecstatic about finally getting rid of the skin rash and the unbearable itching. Click on the Naturel Spa product to the right that fits your needs best. * Le Naturel Spa is not a sanitizer, biocide, or pesticide. The EPA will only register a product as a sanitizer, biocide or pesticide if it contains an “active ingredient” that is toxic or deadly to animals and/or plants. Le Naturel Spa does not contain any “active ingredient” listed by the EPA, OSHA, or the NSF. Therefore the product cannot be registered as a pesticide, algaecide, or biocide. 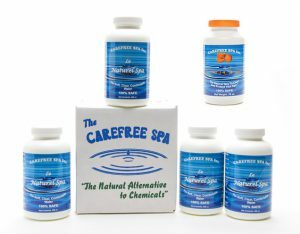 Naturel Spa– Keep your spa safe, clean and crystal-clear with NO TOXIC CHEMICALS.“Hands off” all natural spa maintenance with NO chemical balancing, regular testing or regular shock treatments! Four 16-oz. Bottles purchased individually $87.80. Natural Spa 4-Pack $76.95 A 12% savings over individually purchased bottles! 12% savings over individually ordered bottles! Combo 4-Pack $76.95 A 12% savings over individually ordered bottles! 12% savings over individually purchased bottles! Combo 5-Pack $95.95 A 12% Savings over individually purchased bottles! Naturel Spa Starter Kit – 20 oz. of Citri-Clean and 16-oz. bottle of Naturel Spa. A 1-2-punch for a healthy spa. Eliminate scale, corrosion and chemical buildup in your spa caused by chemicals used in the past with Citri-Clean. Then keep it clean, safe and crystal-clear with Naturel Spa. Citri-Clean and Naturel Spa purchased individually $43.90. Starter Kit $38.95 A 12% savings over individually purchased bottles!